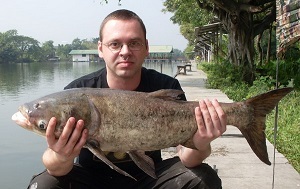 Austrian angler Thomas a returning client started his fishing holiday with a visit fishing at Now Nam Lake in Bangkok. After bagging up with Big head Carp and Koi Carp on his previous fishing holiday the Austrian angler chose to begin fishing at Now Nam Lake. On arrival at the lake the angler wasted no time in casting out floating bungs towards fish showing in the centre of the lake. After only ten minutes one of the floats burst into life and quickly sank beneath the surface indicating a bite. Winding down into the fish resulted in the rod being dragged towards the surface as a Striped Catfish embarked on a powerful run. A ten minute battle followed which saw the angler following the catfish along the fishing platform in an attempt to regain line back onto the reel. After finally netting the Striped Catfish the catfish was hauled onto the unhooking mat revealing a plump catfish of an estimated 12kg’s. Further casts towards the centre of the lake produced more Striped Catfish of a similar size which tested the anglers fishing equipment to its limit. A quiet spell in the middle of the day saw no further bites forthcoming until a change of tactics to the method feeder saw a slow determined take pulling line from the baitrunner reel. Thomas reacted immediately by tightening the clutch and setting the hook causing a large boil to form on the surface of the water several yards out into the lake. The unseen carp plodded up and down a few rods lengths out from the platform before making several deep dives in an effort to evade capture. The fish showed on several occasions revealing the unmistakable form of a Big Head Carp before being brought to the waiting landing net with relative ease. After hoisting the Big Head Carp onto the unhooking mat the fish was estimated to weigh 15lb’s before being proudly displayed for the camera. The day continued to produce further Striped Catfish to an estimated 10kg’s at regular intervals seeing the angler amassing a double figure haul of Striped Catfish in addition to a good sized Big Head Carp of 15lb’s.